Provide several birds with a wealth of dining options using this Heath Dual Owl Duo Bird Feeders set. These two charming, owl shaped feeders bring whimsical style to your garden in moments, while holding two different varieties of feed for your feathered friends. Each brown, steel frame creates a familiar owl silhouette, and two closed, white eyes, a brown brow, and orange beak form an expressive face on each. The mesh bodies easily hold 1.7 quarts of peanut chunks or sunflower seed each, and the diamond-shaped openings allow clinging birds to dine from all sides. A square chamber occupies the center of the pieces, and the bright orange color and curved horizontal rods evoke the feathers found on a barred owl. These chambers accommodate one standard suet or seed cake each, helping you feed a variety of birds. A latch on one side of this section keeps the suet nicely in place, and allows you to clean or refill the area. Lift the metal panel at the top of each owl to refill the units, and use the attached chain here to hang them with ease. Locking rings keep the feeder lids closed, and the mesh bodies make it simple to monitor feed levels. The steel construction lasts for many seasons, and the bold colors and familiar shape of each bring a wonderful hint to your garden. 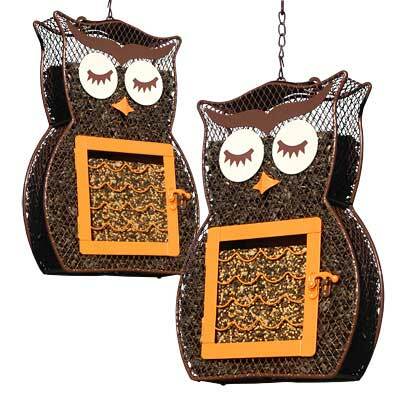 Enhance your yard with a hint of nocturnal wildlife and a bevy of bird seed using this Dual Owl Duo Bird Feeders set. Note: This package contains 2 of the Heath Owl Seed and Suet Bird Feeders.